1. Visit the BOM site. 2. Download the daily maximum temperature data for your region. NOTE: The data must include the range 1961-1990. 3. Click the link above to upload the CSV file. 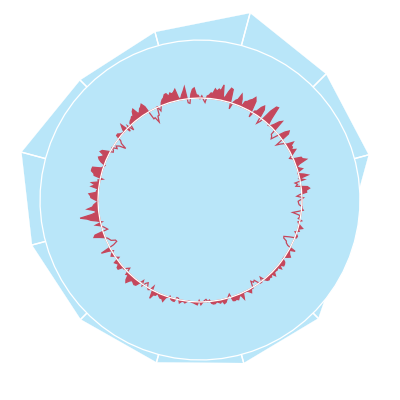 The inner and outer rings represent the selected region’s long-term average derived from maximum daily temperature readings for the period 1961-1991. 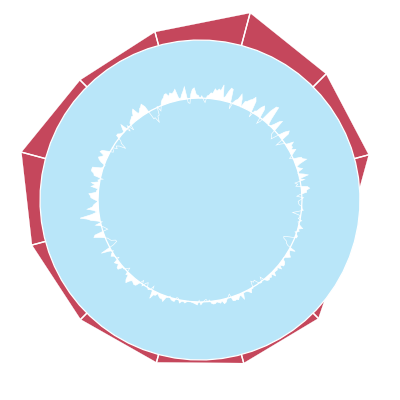 The inner graph represents the selected year’s daily maximum temperatures relative to the long-term monthly average maximum temperature. 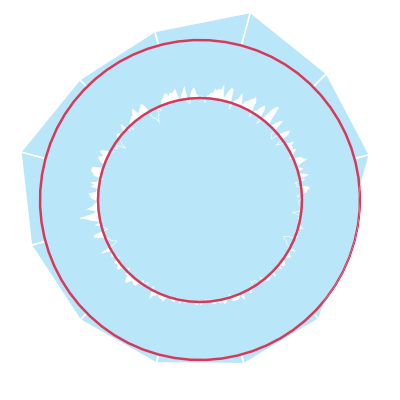 The outer edge represents monthly averages derived from the daily maximum temperatures relative to long-term monthly average. The timeline shows annual average derived from daily maximum temperatures. Click on a block to select that year. The place icon shows the currently selected location. Click the Play icon to view an animated transition for the period 1991-2017. Click the Save icon to download a copy. Choose between an image for printing and social sharing, or an image for laser cutting. Upload allows you to manually add data for a region not listed in the 112 ACORN locations. Appropriate data files can be downloaded from the BOM. A file must include daily maximum temperatures for the period 1961-1991. 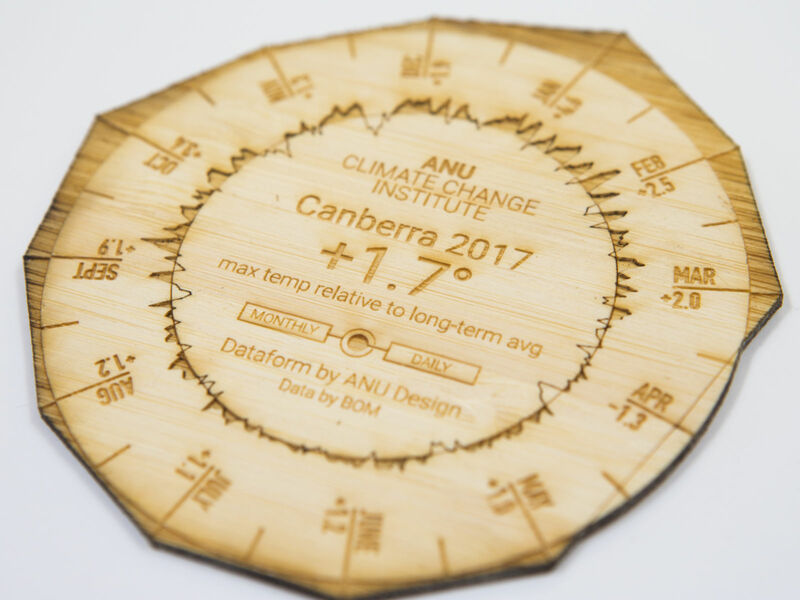 The ANU Climate coaster is a collaboration between the ANU Design Lab and the ANU Climate Change Institute. The work uses the Bureau of Meteorology’s ACORN-SAT dataset to represent maximum daily temperatures relative to long-term averages for 112 different locations across Australia. Geoff Hinchcliffe and Mitchell Whitelaw produced the work for ANU Climate Change Institute’s Climate Update 2018. The coaster represented Canberra’s 2017 temperature data in a novel tangible form. The compact dataform could be read as a graph but also explored through touch and even smell. Its physicality offered a compelling way to comprehend the data; to feel the peaks of 2017’s record-breaking maximum temperatures. 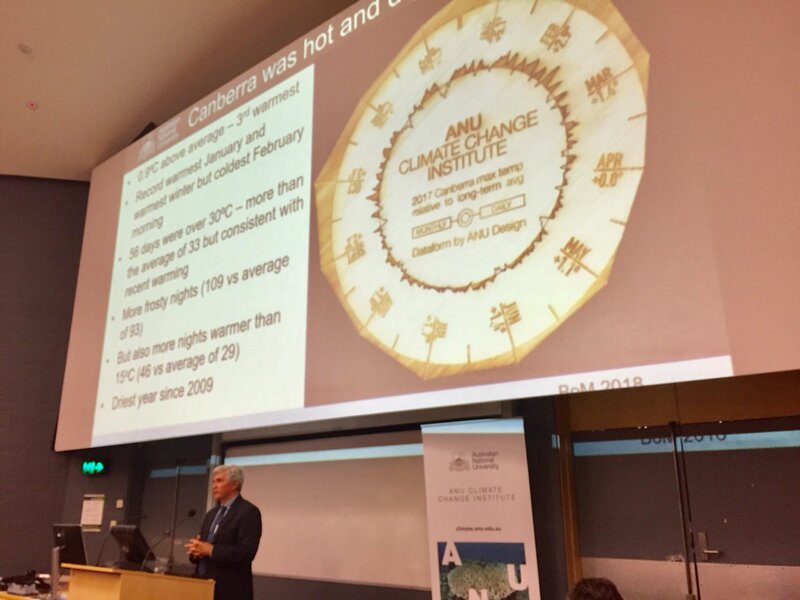 The coaster elicited enthusiastic audience engagement and lively conversation which motivated production of a second version localised for the CCI’s Brisbane edition of the Climate Update. The title of the work draws on its physical similarity to a drink coaster. We hope that printed coasters will occupy coffee tables across Australia and spark conversation and reflection on our rapidly changing climate. 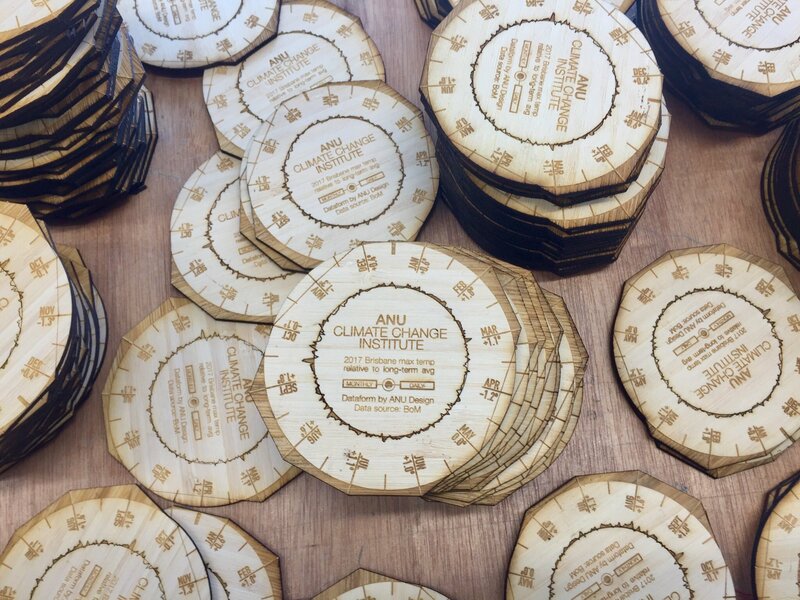 The ANU Climate Coaster project is generously supported by the ANU School of Art & Design and the Research School of Humanities & Arts. 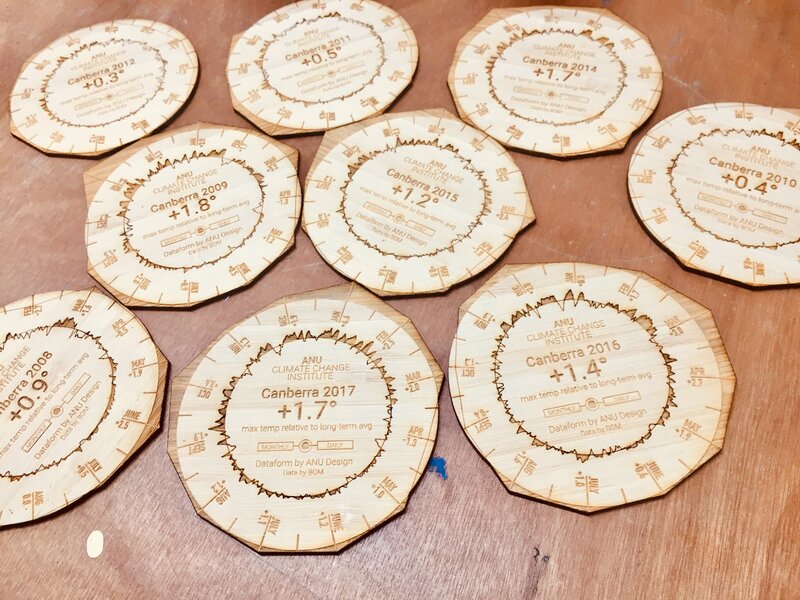 Version 1 of the coaster produced for State of the Climate in Canberra 2018. Professor Mark Howden presenting at State of the Climate in Canberra 2018. An edition representing 10 years of Canberra weather data. An edition for the State of the Climate in Brisbane 2018.